There is top-class cricket at Bretton Gate this weekend. Peterborough Town Sports Club provides cracking sport alongside its popular annual beer festival this weekend (June 23/24/25). 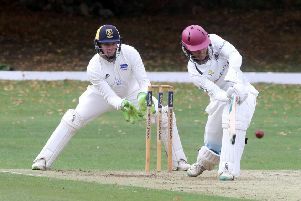 Old Northants Premier Division rivals Peterborough Town and Finedon clash in a cricket league game tomorrow (noon), while a seven-a-side hockey tournament will run from 1030am on both weeekend days. There are two hockey tournaments at Bretton Gate on beer festival weekend. The club also boast excellent tennis, bowls and squash facilities, all of which will be in full use all weekend. There will be a squash tournament to view on Saturday should the weather turn bad! City of Peterborough Bowls club will be hosting two league games on their lawn tomorrow, while on Sunday City’s tennis team is involved in the prestigious Don Brace Cup. Over 20 ales will be on offer in the fifth Peterborough Town beer festival all weekend starting tonight when junior cricket league matches will be played on the main square. Cider and lager choices and a gin bar are also available. Hot and cold food is available all weekend with a hog roast served from 6pm. There will be live music on all three nights.